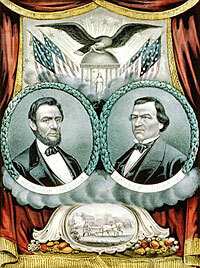 According to Morgan biographer James A. Rawley wrote: “Morgan aimed to reconcile the two factions of the Union party. A few days before the Baltimore convention he was in correspondence with Horace Greeley, Radical spokesman. Greeley drafted four compromise resolves for incorporation in the platform. When the Tribune‘s editor learned that the conciliatory Morgan had sent the resolves to conservative Henry J. Raymond, editor of the Times and a mortal enemy, he blasted, ‘It is no use sending any thing I write to Raymond. He belongs to the party of eternal War, and his resolve on that point is as belligerent as possible.”7 Historian Sidney David Brummer noted: “The factional struggle in New York was…transferred to the Union National Convention.”8 Morgan, who was retiring as the Republican National Chairman after eight years in the post, spent little time at the convention. Raymond, who became new chairman of the Union National Committee, took on the chief role in crafting the platform. On Monday morning, maneuvering for the vice-presidential nomination became more active. Senator [William P.] Fessenden, answering an urgent telegram from the Hamlin forces, came up from Washington to work among the New England delegations. Sumner tried to counteract his influence. After an informal caucus, several leaders of the Johnson movement decided to abandon him in favor of a New Yorker — Dix, Dickinson, Lyman Tremaine or Edwin D. Morgan. The Johnson movement faced defeat in their defection. If the entire New York delegation had united upon a single candidate, he would have received the support of many western delegations, and would probably have won the nomination. But the New York delegation, split between the War-Democratic faction backing Dickinson and the Weed-Seward element still favoring Hamlin, was unable to capitalize on this development. 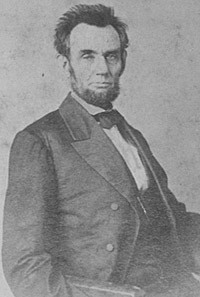 Instead, it divided still further as the Dickinson forces picked up supporters in the West, and the Seward faction, fearful that their leader would be forced out of the cabinet if New York received the vice-presidency, tried to launch a movement for General W.S. Hancock. Realizing that the New York stalemate was the pivotal point in the ultimate decision, many delegations withheld commitments until the Empire State delegates reached agreement. Thurlow “Weed would have been content to renominate Hamlin, and so thought a majority of the New York delegation, but the coolness of many New Englanders to the Vice-President and the outright opposition of Massachusetts made this impracticable.” wrote Weed biographer Glyndon Van Deusen.16 In particular, Charles Sumner, chairman of the Senate foreign relations committee and a rival with Seward for influence in foreign affairs, wanted the Secretary of State replaced. So Sumner rallied Massachusetts Republicans to replace Hamlin — not because he disliked Hamlin but in part because he preferred Hamlin to occupy the Maine Senate seat of William Pitt Fessenden, whom Sumner did dislike. Ironically, Fessenden did leave the Senate shortly thereafter — but to replace Secretary of the Treasury Salmon P. Chase at the beginning of July. The Baltimore event was more a grudge match than a convention. “The critical situation within the Empire State delegation continued to wield a powerful influence on convention opinion. With the convention settled in favor of a War Democrat, and with no hope of New York’s reaching an agreement, numerous delegations held evening caucuses. Both Dickinson and Johnson profited from the extensive abandonment of Hamlin. Under the impetus of Weed’s promotion the waning Johnson movement was revitalized to surpass its original strength. Weed was confident that the Tennessean’s victory was inevitable. Late in the evening after turning the Seward faction’s leadership over to Raymond, the lobbyist left for New York,” wrote historian Glonek. 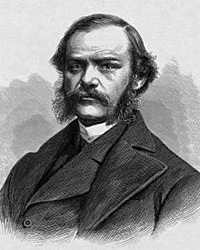 Historian William Frank Zornow wrote: “There was also the New York delegation to consider for there was much support being given her native son Daniel S. Dickinson, who was the choice of the Unconditionals led by Lyman Tremain[e]. Before the convention Chauncey Depew and W. H. Robertson called on Seward who informed them Lincoln preferred the selection of Johnson. At the first meeting of the delegates, Hamlin and Dickinson had the greatest support. Weed was anxious to prevent the selection of Dickinson, for his election would have forced the resignation from the cabinet of William Seward, who was another New Yorker. Weed and Raymond had engineered the admission of the delegations from Tennessee, Louisiana, and Arkansas in return for a promise to oppose Dickinson. In the vice-presidential race ten candidates were in the field at the completion of the first ballot. At the balloting progressed it became evident that the contest was between Johnson, Hamlin, and Dickinson. None of the other seven candidates, Butler, [Joseph] Holt, General Lovell H. Rousseau, General Ambrose E. Burnside, Congressman Schuyler Colfax, ex-Governor David Tod of Ohio, or Preston King of New York had more than weak favorite son or complimentary vote support. On the roll call Johnson polled 200 votes to the vice-president’s 150, and 108 for the New York Democrat. During this roll call Cameron continued his calculated but futile efforts in behalf of Dickinson. The delegations of the Northeastern states, where the New Yorker’s support was strongest, had voted. While the remainder of the delegations were voting, Cameron, who had cast Pennsylvania’s 52 votes for Hamlin, conferred with the New York delegation. He promised to transfer Pennsylvania’s vote to Dickinson if the New Yorkers would united on him. Such action would have augmented Dickinson’s support by 90 Hamlin and Johnson votes. By bringing over other delegations which were under Weed-Raymond influence, it would have insured Dickinson’s nomination. Quite understandably, Seward’s New Yorkers refused Cameron’s offer. Johnson’s candidacy was saved. Immediately after the completion of the first ballot, Kentucky, Oregon, and the Kansas delegation, which had previously been split, cast their votes for Johnson. This gave the Tennessean a total of 231 votes, only 28 votes short of nomination. Then, over the protest of Thaddeus Stevens, Cameron threw Pennsylvania’s full vote to Johnson, thereby insuring his nomination. Subsequently it was made unanimous. After Indiana nominated Andrew Johnson, according to contemporary journalist Noah Brooks, “Simon Cameron nominated Hamlin without any speech; Kentucky presented General [Lovell H.] Rousseau; and Lyman Tremaine, in behalf of a portion of the New York delegation, presented the name of Daniel S. Dickinson. The popular demand for a War Democrat had induced some of the New Yorkers to present Dickinson’s name, but it was well known that most of the New York delegates favored Hamlin, and their argument was that if Seward was to remain in the cabinet it could hardly be expected that a New York would be made Vice-President. There was much buttonholing and wirepulling while the vote was being taken, and before it was officially announced: but of the 520 votes cast Andrew Johnson had 202, Hannibal Hamlin 150, Daniel S. Dickinson 109, Benjamin F. Butler 289, and 31 votes were scattering; so there was not choice.”25 Thereafter, delegation after delegation fell in line behind Johnson. Sidney David Brummer, Political History of New York State During the Period of the Civil War, p. 383. Gideon Welles, Diary of Gideon Welles, Volume II, p. 44-45 (June 3, 1864). Howard K. Beale, editor, The Diary of Edward Bates, p. 377 (June 17,1864). Allan Nevins, The War for Union: The Organized War to Victory, 1864-1865, p. 74-77. John M. Taylor, William Henry Seward, p. 231-32. Sidney David Brummer, Political History of New York State During the Period of the Civil War, p. 381-382. James F. Glonek, “Lincoln, Johnson, and the Baltimore Ticket”, The Abraham Lincoln Quarterly, Vol. VI, No. 5, March 1951, p. 263-265. Allan Nevins, The War for Union: The Organized War to Victory, 1864-1865, p. 75-76. Glyndon Van Deusen, Horace Greeley: Nineteenth-Century Crusader, p. 308. Charles M. Hubbard, Thomas R. Turner and Steven K. Rogstad, The Many Faces of Lincoln: Selected Articles from the Lincoln Herald, p. 100 (William Zornow, “Lincoln’s Influence in the Election of 1864”). Chauncey M. Depew, My Memories of Eighty Years, p. 61. James F. Glonek, “Lincoln, Johnson, and the Baltimore Ticket”, The Abraham Lincoln Quarterly, Vol. VI, No. 5, March 1951, p. 268-269. William Frank Zornow, Lincoln & the Party Divided, p. 101-102. James F. Glonek, “Lincoln, Johnson, and the Baltimore Ticket”, The Abraham Lincoln Quarterly, Vol. VI, No. 5, March 1951, p. 266-267. James F. Glonek, “Lincoln, Johnson, and the Baltimore Ticket”, The Abraham Lincoln Quarterly, Vol. VI, No. 5, March 1951, p. 267-268. James F. Glonek, “Lincoln, Johnson, and the Baltimore Ticket”, The Abraham Lincoln Quarterly, Vol. VI, No. 5, March 1951, p. 269-271. Noah Brooks, Washington in Lincoln’s Time: A Memoir of the Civil War Era by the Newspaperman Who Knew Lincoln Best, p. 147. Chauncey M. Depew, My Memories of Eighty Years, p. 60-61. John M. Taylor, William Henry Seward, p. 232.